A blog of knitting, painting, movies, life and just about anything I feel like talking about. It's been four years since I last posted on here. So much has changed in my life. I remember writing about my depression I was suffering from, and how I was struggling with Life. I'd never felt so ill before, it was an awful time and one I struggled to understand. I became another person, a person who had no life in them, who felt 40 years older than they were. A person who felt numb and couldn't see past how the illness was making me feel. I was ashamed, I felt I had let my family down. I was "supposed" to be a strong wife and a dedicated confident mother. There was no way "I" could suffer from depression. The realisation hit me hard. I was no different to anyone else. I'm human after all. Wow Life Really Does Start At 40!!!! Last Friday my hubby surprised me with a gift. He went out and came back with a brand new bike for me. I had done nothing but talk about getting a bike these past few weeks, as my sister and her family go bike riding at the weekends. I can join them now, and we've been having so much fun. I love my new bike, infact I don't want to go out without it now. Getting to work and back is so much easier. The roads are scary but I'm getting more confident. Having a bike has helped me feel young again, and I feel like I have a new lease of life. I'm really looking forward to this summer, lots of days out with full of adventure as I go cycling with the family. Why do I find it so hard to de-clutter? I have so many and although I have read most of them and may not read them again, although I do hope one day I will. I just can't seem to bag them up and give them away. I am like this with everything, clothes, the kids toys, everything!!! Why I'm this I don't know? Hubby on the other hand wishes I would sort my stuff out. 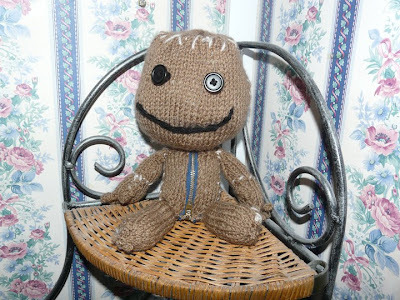 These are some Sackboy/girls I made for family for xmas. I really enjoyed making them. I especially enjoyed doing the girls, although making their hair was really testing my patience at times. But once I got into the swing of it I was fine. In a couple of months, I'll have reach the grand middle age of 40. Why don't I feel excited about this though? I find it hard to believe, I'm actually going to be 40!! They say life starts at 40, how does it? Since my eldest son moved out a year ago, and who now lives with his girlfriend, I feel so old. It's like I'm now where my parents were, the old fogey. Yet, I know deep down that's not true. I don't see other people in their 40' 50's or 60's as old. Yet I see myself as old lol. Weird hey? I do feel a responsibility since my boys have all grown up to act in a respsonsible adult way. When they were small, I felt like a kid myself and loved to join in their games. I was always playing their board games with them, hide and seek etc. I do miss those days. They were fun. I know I have all that to look forward to in the future with my future Granchildren. I'm wondering, do all mums feel like this as their children grow into young adults? Meditation, is one of the best things you can do for relaxation and peace of mind. I used to think it was just sitting as still as you can. But there are so many different ways to meditate. Anything that causes you to become focused, relaxed and to be away somewhere in your 'zone', is meditation. For me, knitting is my number one way to meditate. Wow it makes me feel great! Hiya, I'm Married to a wonderful man (28 yrs this yr) and we have three beautiful grown up children. I'm a Christian. I became a Christian on 11th August 2013. My life has soared since. I thank God for saving me from the despair and suffering I was experiencing. My life has changed so much since I became a Christian. (I was brought up as a Jehovahs witness and then went onto paganism) I attend a wonderful Church every Sunday, Who have taught me Christianity is not a religion, it's having a relationship with Jesus. There is a big difference. I love the new hobby hubby and I have taken up....QQuad Copters.